Only two weeks after their magnificent 6-2 away win over PSV, Twente went into this match a hurt team. Coming off an Eredivisie loss against N.E.C. and a painful 4-1 Europa League loss at Schalke, Steve McClaren’s team stumbled to a third consecutive loss at the hands of a well organized Feyenoord side. The starting line-ups. Note that Feyenoord's wingers frequently switched flanks in order to improve their ball retention and offensive efficiency. Twente missed both of their experienced centre-backs Douglas and Wisgerhof in this match, and young Nils Röseler paired stand-in centre-back Rasmus Bengtsson to make his first Eredivisie start. Furthermore, goal keeper Nikolay Mihaylov wasn’t fit enough to start, giving veteran Sander Boschker his first competitive match in over six months time. Veteran full-back Tim Cornelisse replaced Roberto Rosales at right-back. In formational terms, their 4-3-3 is undisputed. Today McClaren opted for inverted wingers, with Nacer Chadli on the left wing, and Ola John playing right. With offensive full-backs and overlapping central midfielders, Twente’s lone striker Luuk de Jong should theoretically be provided enough support. 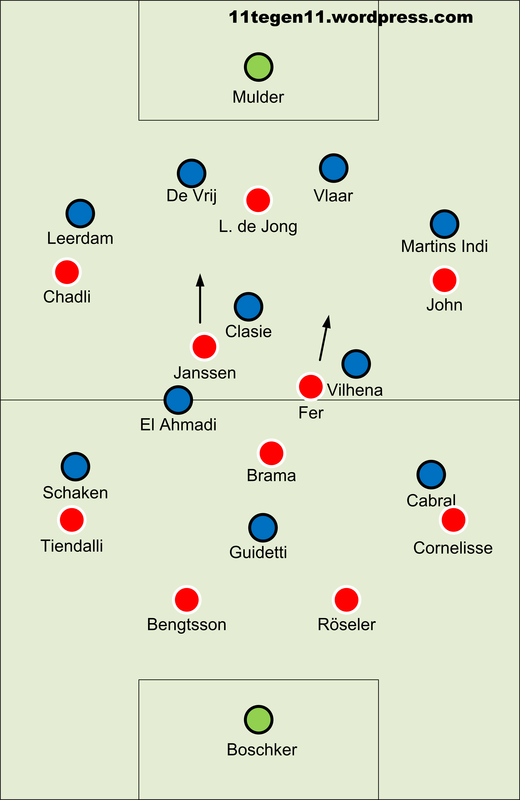 Playing the same formation as Twente, Feyenoord gave it more defensive outlook. Particularly their central midfield was primarily aimed at frustrating their opponents and winning possession, rather than providing overlapping runs themselves. In personal terms, 17-year old Tonny Vilhena made his debut, playing alongside Karim El Ahmadi with holding midfielder Jordy Clasie behind them. In defense, Nelom missed out, so Bruno Martins Indi featured at left-back. The game started with Twente dominating possession as high as 70% over the first fifteen minutes, but this hardly meant any danger for Feyenoord’s compact lines. Most of Twente’s possession was in their own half and Feyenoord seemed more than happy to allow that to happen. Gradually, though, Feyenoord’s midfield started to raise the pressure on Twente and it was this tactical battle that formed one of the highlights of this attractive match. What followed was a practical battle where Feyenoord tried to apply pressure on their opponents and Twente aiming to apply their superior technical skills in playing around it. This phase of the game was certainly not about creating goal scoring chances, but merely about gaining the upper hand going into the later stages of the game. Should Twente succeed in maintaining possession dominance as high as their 70% of the initial fifteen minutes, then Feyenoord would sooner or later run out of gas, having to press for two-thirds of the playing time. However, should Feyenoord obtain some success with their demanding out-of-possession playing style, they would have all sorts of space to create danger with early turnovers. Compare this to their performance against Ajax, whom they defeated with an excellent out-of-possession tactic. While initially it looked like Twente would win this battle and play around Feyenoord’s midfield, near the end of the first half this proved quite different. Twente’s midfield passing became unusually sloppy, a least partly as a result of Feyenoord’s excellent work in midfield. Feyenoord’s main problem in this first half was the substandard ball retention by their wingers. Most of their turnovers were circulated to one of Schaken and Cabral, but both wingers lost possession a lot and this didn’t help the possession versus pressure battle that was going on. Koeman could be seen to instruct his wingers to switch flanks more than once, but this didn’t solve the problem. However, going into the break, Feyenoord dominated the amount of shots created 6-3 over Twente. Only a few minutes into the second half, Feyenoord was rewarded for slowly gaining the upper hand in the aforementioned tactical battle. One of many misplaced passes in Twente’s midfield, by Chadli this time, opened up the opportunity of Feyenoord to counter quickly over the left wing, where Jerson Cabral clearly outpaced Tim Cornelisse. His cross was unintentionally met by the heads of both Twente centre-back, leading to a rather (un )lucky opening goal. Now sitting on a 1-0 lead, Feyenoord’s attitude towards the pressure-possession game altered somewhat. Their game seemed more aimed at controlling possession and their defensive four started seeing more of the ball. Of course, Twente tried to launch an offensive with over thirty minutes to play, but generally, their midfield passing was not up to standard. Both inverted wingers were directed closer to striker Luuk de Jong, whose target man qualities were more and more searched with hopeful direct high balls. Twente’s best chance to level the score came through one of these early high balls, flicked on by de Jong, but Chadli saw Feyenoord goal keeper Mulder save excellently with his left foot. Feyenoord’s control of the game was illustrated by their share of possession increasing after their opening goal. They finished the game with a 49% share of possession and 322 passes, 120 of which were made in the final thirty minutes. This shows Twente’s failings at pressuring Feyenoord, as a well executed home team offense would have lead to less Feyenoord possession and certainly less passes executed. Substitute striker Cissé put the win beyond doubt by scoring Feyenoord’s second goal. By that time McClaren had depleted his defense in an ultimate attempt to level the score. To no surprise, all three of Feyenoord’s midfielders formed the top-3 in their public Man of the Match vote, carried out on Sidekick, the recently launched app by Eredivisie Live. Rising star Jordy Clasie pulled the strings in midfield and was named MotM in the end. Feyenoord won the crucial battle that took place around the 15th to 30th minute. Initially, Twente dominated possession this much that Feyenoord could never have maintained their level of pressure for the full ninety minutes. By the looks of Twente’s patient approach to the opening phase of the game it seems that they aimed to overcome a tired opponent in the second half. But since Feyenoord forced Twente’s midfield into sloppy passing by their standards, the opportunities for the away side to open the score started to arise near the end of the first half. And come the second half Feyenoord needed only a few minutes, and admittedly, a lucky deflected own goal, to take the lead. In the final half hour, Twente seemed unable to adequately pressure Feyenoord, as was illustrated by the broad possession and passing stats. All in all, the result seems a fair reward for Feyenoord’s performance, with the midfield three of El Ahmadi, young Vilhena and MotM Clasie particularly on song. Feyenoord is building up a hard to defeat team from the defense to the attack. They already have contracted transfer free defenders and midfielders for next season although they have also quite potential defenders and midfielders coming from their own youth. If they manage to better their wingers and striker (Guidetti is on loan from Manchester City) they will be a candidate for the title next season. There’s a common notion that lots of Dutch teams neglect their defense for the benefit of their attack. Which is probably the reason for the exciting ranking of the Eredivisie. Don’t be surprised when after the next round of the Eredivisie both AZ and Ajax will have 53 points, PSV and Twente 52 points and Feyenoord and Heerenveen 51 points. That excitement will probably continue until the last round. The analysis given here is correct. Feyenoord again went straight to the goal of Twente where Twente took longer for that because of the defensively(!) strong attackers and midfielders of Feyenoord. The given link to sidekick illustrates that well when you look at the passes given by both Twente and Feyenoord.